AIR leads a consortium to implement TCPP with ChildFund, Save the Children, Catholic Relief Services, CARE, FEREMA, and Fundación ANED. The project, which began in 2011, aims to improve student achievement and literacy outcomes and strengthen community participation in school management and classroom pedagogy in 115 municipalities in Honduras. TCPP helps local councils analyze education data and end-of-grade test results and supports them to develop, implement, and monitor education improvement plans. Based on the educational context and needs of individual municipalities and schools, the improvement plans outline specific training and technical support for teachers and principals. Improvement plans can focus on areas such as pedagogy, teaching methods, and content knowledge. TCPP staff also provide technical support to schools in cross-cutting areas, such as gender-sensitive approaches in the classroom and school, intercultural bilingual education, and fostering a culture of peace in schools. In a preliminary analysis, AIR found that on average, the 115 municipalities where TCPP works showed greater improvement in primary school student achievement in reading than in municipalities where the project does not work. To date, project staff have trained more than 23,600 teachers and 2,600 principals in data-driven decision-making based on student academic performance. These teachers and principals have improved knowledge and skills and many now serve as resources and trainers in their schools and school networks. The project will train an additional 1,700 teachers in 2017. TCPP staff have enabled more than 600 school and municipal councils to analyze educational data, develop plans to address challenges in their communities and schools, and monitor the implementation of their plans. The project also supplies reading and learning materials to school libraries. 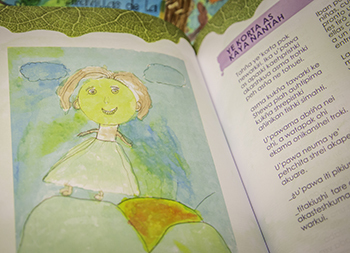 Honduran students authored and illustrated 42 anthologies written in Spanish as well as indigenous languages such as Garifuna, Miskito, Tol, and Pesh. TCPP staff printed and distributed 66,000 copies, while the Ministry of Education printed and distributed an additional 192,000 copies. These culturally relevant story books have been well received in Honduras because they make an important contribution to creating print-rich environments in communities where reading materials are less available to students. TCPP staff will continue to procure, print, and disseminate reading material to school libraries in 2017.